I am doing something yummy for money! Our office is doing a week-long bake sale to raise money for Comic Relief. Comic Relief is a charity based in the UK that was set up in 1985 that aims to raise money to tackle the root causes of poverty and social injustice. The money that gets raised each year helps so many people and I enjoy doing my bit to contribute, albeit in a very small way. I’m going to bring coffee and walnut brownies tomorrow. It’s still chocolate but it’s got a distinct coffee taste that cuts through the chocolate quite nicely, or at least, I think so! I love the recipe enough to share it. I think this would be great with a cup of milky tea or, what else, coffee! If you try the recipe, please tell me what you think! I’d love the feedback. Prepare a baking tray by greasing and lining with parchment paper and set aside. I learned that when you grease the baking tin that you plan to use, it’s a good thing to also grease the parchment paper you line the baking tin with. 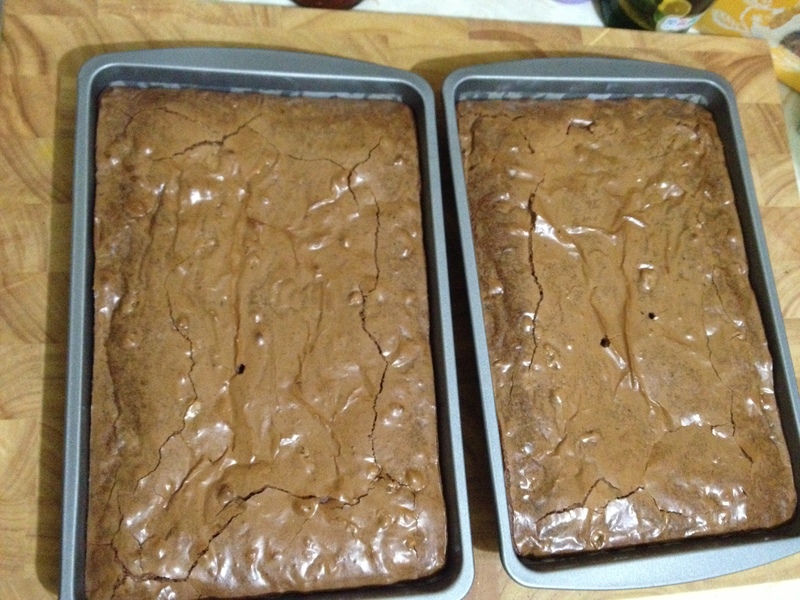 It prevents the parchment from sticking to the cakes and makes for easy removal. In a bowl, mix flour and choppped walnuts together, making sure that the walnuts are completely coated in flour. Place chocolate, butter and instant coffee granules in a heat-proof bowl over a sauce pan of simmering water. Leave until melted completely but making sure you stir once or twice to make sure that everything is combined properly. Remove from the heat once everything is melted completely and well-incorporated. In a free-standing mixer (this can also be done by hand or a hand-held mixer), mix sugars and egg and beat until the mixture is smooth and fluffy-looking. I read somewhere that this usually takes about 5 minutes, but what I look out for is a change in colour, the batter becomes a paler shade of what you when you started to cream the sugars. Pour chocolate mixture slowly into egg and sugar mixture and mix until everything is well-combined. Add the flour and walnut mixture and mix until the batter is thick and smooth. Spoon the mixture into the prepared baking tray and bake in the preheated oven for 30-35 minutes, until a skewer inserted comes out clean. The top will look shiny and flaky. 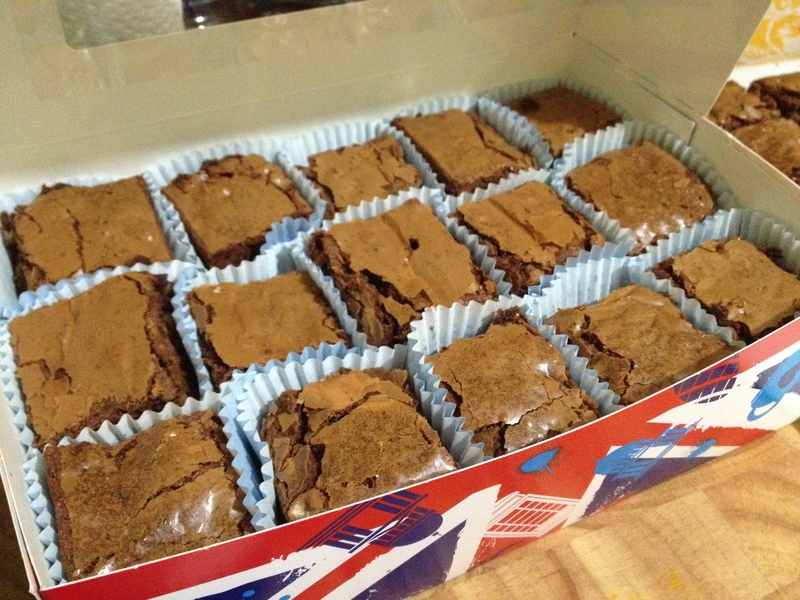 Be careful not to over cook as the brownie can become hard and very chewy. This can make up to 24 squares, depending on how large your slices are. Just made these! Absolutely delicious!